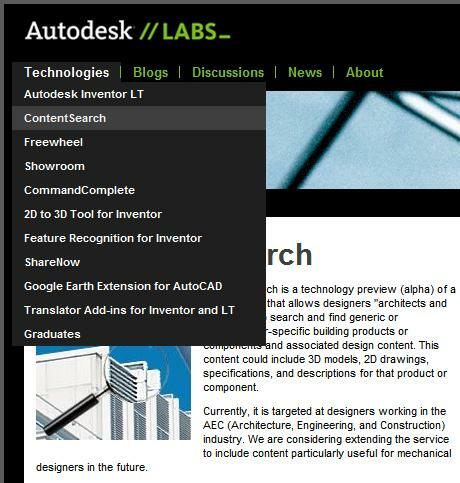 Autodesk Labs has released a technology preview for Content Search. Please give it a try and let the Labs team know what you think: [email protected]. You can use text search capabilities to locate DWF files (as well as other formats such as PDF or DWG). In the case of DWF, you can view the design data using Autodesk Freewheel. If you like what you see, you can download the design data in one of the available file formats and include it in your own designs. Since Autodesk Freewheel requires only a browser, you can locate design data without having the design authoring application. With this ease of access, DWF definitely goes beyond the paper. Well, it seems that we are back to the subject of "Text Search". Mind you, we had many many requests from customers to introduce such functionality and it appears that there is some movement in the great halls of Product Design. As a matter of fact, Product Design are asking for your input, so here it goes: "When it comes to text search, we know what you want. While viewing a DWF file, you want the ability to type in a text string, hit enter, and have the Autodesk DWF Viewer take you to the destination sheet and navigate to the text. We know this. The item is on the wish list. It is being considered for an upcoming release and we are in the process of researching text search further. What is your priority for search text in 3D canvas? e.g. True text as part of drawing, not metadata such as part number, properties and etc. We’d like to get a better idea of what your files look like. It’ll be very helpful if you can send us some sample files with 3D text on them." It would be great, if you could let us have any feedback or even files you may wish to contribute to the subject matter. Feel free to send me an email directly, should you prefer to keep your content and files out of public view. Autodesk, Inc. and GlobalSpec, Inc. announced a strategic partnership that enhances recently announced Autodesk Design Review 2008 software to include on-demand access to GlobalSpec's extensive product and information services. By connecting specification and procurement decisions more directly to core design tasks, the companies are helping to streamline and redefine the design process. Autodesk Design Review 2008, the company's advanced DWF-based review and markup tool for project teams, includes seamless access to GlobalSpec search capabilities. Project team members such as manufacturing and quality engineers, production planners, suppliers and customers who use Autodesk Design Review to review CAD drawings or models benefit from the advanced content features of SpecSearch - GlobalSpec's trademarked search technology. "We are very pleased to partner with GlobalSpec," said Kevin Wandryk, senior director, Extended Design Group, Autodesk. "Together, we're helping our customers extract even greater value from the rich detail present in 3D design information, by better connecting design to procurement for streamlined production, improved decision making and faster time to market." Today, Autodesk Inventor software users can publish a DWF file and securely share rich design information such as bill of materials, part numbers, manufacturer and other information. By launching an Internet search of GlobalSpec content from within Autodesk Design Review 2008, extended team members such as purchasing agents can leverage this information provided by the Inventor user, and make better-informed decisions, boost product quality, time to market and profitability. "Together, Autodesk and GlobalSpec are providing the industry with the potential for greater efficiency and cost-effectiveness," said Guy Maser, senior vice president of marketing, GlobalSpec. "With the combination of design information captured by DWF technology and exhaustive resources from GlobalSpec, customers will save time and money by locating the suppliers who have the parts that they need - without ever leaving the design itself." Docupoint Marketing Manager, Brad Bishop, reports that Docupoint announced a Master Reseller Program for their flagship product, Discovery 2007, an integrated search application for AutoCAD drawings. Discovery combines the functionality of a full text search engine, web server, and automatic DWF generator … into a server application. Discovery integrates core Autodesk technologies including RealDWG for DWG file reading, the DWF Toolkit for DWF file generation, and the Autodesk DWF Viewer or Autodesk Design Review applications for viewing, printing and collaboration. Docupoint’s customers have one thing in common: they have substantial quantities of AutoCAD drawing files and significant numbers of users, especially non-AutoCAD users that need on-line access to the drawing files to perform their daily tasks. The Autodesk DWF file publishing format and the Design Review and DWF Viewer applications are utilized by Discovery, as they are ideally suited for drawing viewing and collaboration while protecting the original DWG file from unauthorized changes. Docupoint customers specifically include LARGE AutoCAD installations, including Belgian Railways, Canadian Broadcasting Corporation, Chevron, Citgo Petroleum, Great River Energy, Kraft Foods, Transport Canada, Turner Broadcasting and the US Army. Discovery is unique in that the pre-indexing and DWF generation process is fully automatic, eliminating time consuming and error prone manual processing. Discovery allows full-text search capabilities, inside all AutoCAD drawings, located on the customers’ entire network, virtually instantaneously. Discovery 2007 adds unique integration with the Autodesk DWF Viewer and Autodesk Design Review applications to provide “SmartZoom”™ to open the DWF file and automatically zoom to the search text occurrences, including abbreviations and synonyms, within the drawing. SmartZoom makes it fast to browse inside each drawing that has the text being searched, jumping from each location of the specified text to the next location, and the next, and the next, etc. “Like AutoCAD, Docupoint Discovery is well suited for large internationally located customers. Our new Master Reseller Program is designed to attract exclusive Distributors for each Country,” said Brad Bishop, Marketing Manager. “Docupoint encourages local-language versions to be tailored by each respective Distributor for each Country.” In addition, each Distributor that signs up to re-sell Discovery can use Docupoint’s COOP marketing funds to offset the costs of internationalizing Discovery and to market the product via such web-friendly advertising tools as Google’s AdWords. The Docupoint Discovery 2007 server application runs on Microsoft Windows XP (client or server) or 2003 Server. Client computers require Internet Explorer 6.0 (or higher) and a choice of the Autodesk DWF Viewer for routine viewing and printing or Autodesk Design Review for collaboration and mark-up. More information on Docupoint Discovery 2007, including a fully functional downloadable demo, can be obtained from Docupoint's web site at www.docupoint.com. In a previous DWF Text Search blog posting, I mentioned Buzzsaw, IFilterShop, Google, and Windows Explorer as avenues for locating design data using text strings. Docupoint Discovery is another available tool in the arsenal. Docupoint Discovery is a software application that works just like a standard web search engine except that it is used to access your AutoCAD drawings across a LAN, intranet, or the Web. With Docupoint Discovery you can locate drawings by the words and numbers stored inside the drawing; simply enter the search string and press the Search button. To view a drawing listed in the search results, just select the link, and the view will open right inside your web browser. Docupoint Discovery does not require AutoCAD. It is based on Autodesk RealDWG technology. It runs unattended on a server. Docupoint Discovery has the option to have “watch folders,” a scheduler to auto-run the jobs. This means Docupoint Discovery discovers new DWG files and indexes their content automatically. Docupoint Discovery has integrated search functionality with their “Smart Zoom”™ technology. Docupoint Discovery uses DWF files to display the search results and zooms the view to the desired text. To facilitate the Smart Zoom, Docupoint Discovery has an integrated web server for serving up the converted DWF documents. In the olden days of WHIP!, Discovery was known as DrawingSearcher and Whip'N'Post (which made us chuckle since back then we were all fans of the Allman Brothers' "Whipping Post" song). For more info, see the Docupoint web site. Check it out. In response to my DWF Text Search article, Senior Technical Writer, Chris Blocher, provided the following article. Sure Buzzsaw, DWF iFilter, and Google can index DWF files on servers and the Web, but what about your local DWF files? The local solution is to take advantage of a perk provided when either the Autodesk DWF Viewer or Autodesk Design Review 2007 is installed on your computer. When these programs are installed, you can use the Search tool on the Start menu, in Microsoft Internet Explorer, or in Windows Explorer to locate text in DWF files. Note: The steps below are for a clean install of Windows XP Professional. The steps might vary slightly for your Windows setup. Choose View > Explorer Bar > Search. If necessary, click All Files and Folders. In the A Word or Phrase in the File text box, type the term you want to find. From the Look In drop-down list, select a location to search. Optional: To set additional conditions (Date, Type, Size, and Advanced Options) restricting the search further, click More Advanced Options. Click Search. DWF files that contain the search term(s) are listed. The ability to electronically find text in a DWF file is one of the ways DWF goes beyond the paper. This is so much easier and accurate than thumbing through a stack of e-size printouts and eyeballing for text. When it comes to text search, we know what you want. While viewing a DWF file, you want the ability to type in a text string, hit enter, and have the Autodesk DWF Viewer take you to the destination sheet and zoom in on the text. We know this. The item is on the wish list. It is being considered for an upcoming release. In addition to this, there are ways to take advantage of text search now. Buzzsaw is one of Autodesk's service offerings in the area of Collaborative Project Management. As DWF files are uploaded to Buzzsaw sites, their contents are indexed. An index is the way a search engine can find things quickly without making you wait while it searches. It already has a list of files that contain the text - the index. When you ask it to search for a text string, the server simply shows you the files from its premade index. 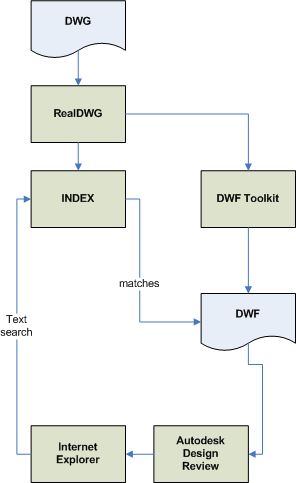 Buzzsaw servers use a DWF iFilter (technology that creates the index) to keep track of text strings in DWF files. The text includes any text. This means file names, sheet names, layer names, property information, text that was entered as part of the design. If there is text in there, the iFilter will find it. IFilterShop shop offers a DWF iFilter. You can use this to index DWF files on your own servers. IFilterShop is an Autodesk DWF Partner. Google is also an Autodesk DWF Partner. So while we toil away developing the next release of DWF-related products, search away.